Bookride: Lazy Liza Lizard. Marie Curtis Rains, 1938. Marie Curtis Rains. LAZY LIZA LIZARD. The John Winston Company, Philadelphia, 1938. Much wanted. Also noted as simultaneously first published by the Junior Literary Guild in New York and E.M. Hale and Co., Eau Claire, WI all in 1938. The Winston one is the one that shows up and no one seems to have established which came first, or possibly no one cares. There are several Lazy Lizards in the world of children's literature but Ms Rains' book is the one you want. No idea what Lazy Liza gets up to but imagine that she gets up late and leads an idle life basking on a sunny wall. The book's reputation seems to be based on its dollar value, Google reveals not one reference to its contents. Library sale special + an ebay special. VALUE? A not nice ex library 1953 reprint at $450 is the lowest priced one currently available and probably a poor investment. Avoid ex library wherever possible is the mantra. A decentish jacketed 1938 first looks a better bet. As often happens on the net as the price gets higher the condition gets worse at $800 you get a sad copy with one page 'torn in half ...and stained from where the page was tape repaired.' Sometimes you get a perfect gradation where there are, say, 6 copies each more expensive than the other and the most expensive is in the worse condition and as they get cheaper they improve in condition with the cheapest being the best. This is perfectly logical because the more greedy a seller is the more he will ignore the effect of condition on price - so the worst copy is often the most expensive. This phenomenom deserves a name - reversed condition paradox? In 2005 on ebay an exlib copy sold at $328 with the buyer providing no picture. Talk about lazy. 'Lazy Liza Lizard's Tricks' from 1953 is more common but still seems to go for a couple of $100 bills if decent. STOP PRESS. A poorish but not exlib 1938 copy sold last week on ebay at $210. 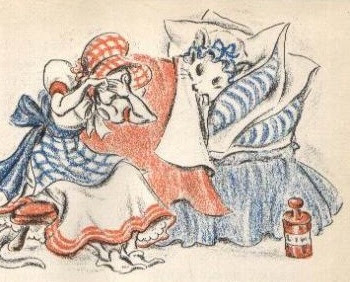 Apart from suggesting that the book is going flat it revealed that Lazy Liza is a pretty young girl (with no obvious lizard discernible) in a gingham bonnet and there are other anthropomorphic characters including a Mr. Snake and Old Lady Field Mouse - a sweet looking story for the very young. I remember the book, Lazy Liza Lizard, from my childhood, as I had checked it out from the school library when in grade school. I was born in 1946, so that gives some idea of the time frame. And pitch you in the lake. In a state of great fright, Liza replied, "Oh please, Mr. Boogey Man, don't pitch me in the lake." This book is a dear part of my memories, and I would love to have a copy if one could be found at a somewhat affordable price. I don't care about the condition, except that it must be readable. My maternal grandmother, born in 1895, told us bedtime tales of Lazy Liza Lizard. I never knew until recently that this was a character in a book. Although I remember very few story details, I vividly remember her chuckles as she recounted the tales. Miss Suzie Bellows read Lazy Liza Lizard to my fourth grade class in Slippery Rock Elementary in 1944. She was a wonderful teacher. I remember her changing her voice with each character. "Lazy Liza Lizard, I'll cut out your gizzard, and throw you in the lake, If you do not return, by break of day, The clothes you stole from Mr. Snake." That's all I remember of the story. We all loved to hear Miss Bellows read. I would love to have any readable copy of this book again. Mine was destroyed in a house fire many years ago. It was my favorite early childhood book. My mother read it to me over and over before I could read it for myself. I remember additional details that other searchers may enjoy recalling. The main characters of the book are the very neat and particular Mr. Snake, his friend, the portly and somewhat unreliable Mr. Frog, who tended to fall asleep in the Southern heat while fanning with Mr. Snake's palm leaf fan. In the opening story, Mr. Snake bakes a beautiful hoecake, puts it in his open window to cool and asks Mr. Frog if he will watch it for him while he takes a swim. After the swim, they will share it. Mr. Frog falls asleep while Mr. Snake swims and the imp, Lazy Liza Lizard in her sunbonnet smelling the good smell of the hoecake, slips up to the window and steals the hoecake. Our bachelor pals discover the missing hoecake, find LLL's tracks and take a shortcut through the bog to beat her home to her cave. They put some of the mud on themselves and stick lighting bugs (fireflies) on themselves and go and hide in the cave. When LLL comes in, they start singing, "Lazy Liza Lizard, I'll cut out your gizzard and pitch you in the lake. You stole away in the light of day, what belongs to Mr. Snake. Snake baked a hoecake, set the frog to mind it. Frog fell asleep and lizzard came and stole it. BRING BACK MY HOECAKE, YOU LONG TAIL NANNY." At this, LLL quaked in fright and said, "Please Mr. Boogy Man, don't get me. I'll take the hoecake back to Mr. Snake and she did. As Mr. S and Mr. F set down with their china and linen napkins to have their tea and eat the hoecake, Mr. F said, "this is an excellent hoecake, Mr. S. "Indeed it is, said Mr. S. There are other characters in other stories such as Mrs. Field Mouse and her many children. I have a signed, 1938 edition, not ex library in mint condition. I bought it on e-bay for around $325 in 2005. It doesn't have a dust jacket however...is that the one you were talking about? I doubt it -this was not signed and was ex library. We never use the word mint (associated with lowly forms of collecting like coins and stamps) but a fine copy is a pretty nice thing and may have increased in value. Good luck. Having checked out the Lazy Liza Lizard book a number of times from my Catholic school library in grade school (probably the late 1950's) I occasionally think about her and wondered whether there were still copies out there. Imagine my surprise when I searched and found out out collectable ($$$) Liza is! I have a number of old children's books, in rather poor condition, that were purged from that library and wish this had been one of them. If anyone is still interested or still looking for copies of Lazy Liza Lizard, I just listed on for auction on eBay. My mom used to have a small book shop, and we are clearing out a little of her inventory that we were storing. Thanks! I too grew up with stories of Lisa Lizard, Mr Frog and Mr Snake. When I was little my father read these stories to me over and over and to this day they are still beloved. Marie Curtis Rains was a cousin of my father and kindly inscribed the first of her two books to daddy as a Christmas gift when she was first published. Liza's adventures were also read to my children and still grace our library shelves waiting for the next generation to delight. I was curious and wanted to see if there were any of these books floating around and was so pleased to find this website and discussion. I am happy to hear that there are others who remember these stories with as much fondness as I. "Never trouble trouble, till trouble troubles you"
I, too, had Suzie Bellows in 4th grade in 1944 at Slippery Rock. I remember the part that Anonymous remembers--and no more. I have looked for this book all of my life and now I find it and I certainly don't need to pay hundreds of dollars for a copy. I needed it 50 years ago. Perhaps the value/selling price of the 1953 edition has to do with the fact that more people who were children from that time are alive today and want to share the exact book they had with their grandchildren?